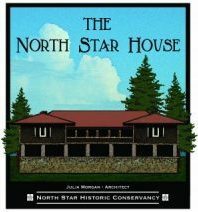 In 1905, the North Star Mining Superintendent A.D. Foote and Architect Julia Morgan would have never expected that the irrigation and lighting at the Heritage Garden at The North Star House would go Solar. Thanks to the generous contribution of Gil Mathews, and his company, Sierra Solar Systems the Heritage Garden will now utilize the power of the Sun to water the plants and light pathways. As a part of his environmental consciousness and continuing community support, Gil Mathews has donated a 1000 KW off-grid solar electric system to the North Star Historic Conservancy, to power the Heritage Garden. This is a full off-grid, stand-alone system that will generate enough power to provide night lighting for events, and even a sound system. Also, there will be daily power for irrigation control, a circulating pond, and running equipment for maintenance. Four solar PV panels on the roof of the garden shed will gather energy from the sun, storing it in a series of batteries for later use, day or night. This system, with components produced here in the United States, will have a useful life of over 25 years. The crew from Sierra Solar was not alone in the Heritage Garden on April 29, 2017 when they installed the solar electric system. The 49er Breakfast Club Rotary adopted the Heritage Garden as their 2017 service project. The 49er Rotary built a new shade pergola around the large Chinese elm tree at the center of the garden. Also, the Rotarian volunteers built paths, did some gardening, installed a patio screen, and many other tasks, to improve the grounds of The North Star House. The rock wall seating in the front of the Heritage Garden was completed by Ron Bailey Masonry this past winter. When weather allows, a second Chinese elm, donated by Jean McKeen in honor of her late husband Dave, will be planted in the front seating area. Planting will have to wait until construction of the pathways and the rough irrigation is completed. The planting plan for the garden has been designed and drawn by James Pyle, of WuWay Landscape, with the assistance of gardeners Carole Miller, Paula Campbell, and Lee Dempsey. Carole and Lee, have been protecting heritage plants found still growing on the property, for transplanting to the Heritage Garden once the irrigation system is in place. The garden benches are being built by Larry Dulmage, President of the North Star Historic Conservancy, and his group of volunteers. The benches are styled after Craftsman vintage Park Service benches. Four benches, donated by Gary Emanuel, Charles & Betzi Hart, Lorraine Plagge and Nancy Tilman, will be placed in the Heritage Garden in late Spring. The reflecting pond, irrigation system, and ADA accessible paths will be installed as part of the next phase of the project. We are still looking for funding and volunteers to complete the final phase of the project. To help with this community effort, please contact Betzi Hart or Gary Emanuel by leaving a message at The North Star House (530) 477-7126.